Document Converter is a batch office document converter that convert doc to html, doc to text, html to doc, text to html and html to text etc, you can convert a lot of files once time, saving your time! CZ Document Converter is a batch office document converter that convert between doc, html, rtf, text, WordPerfect and Works for windows etc file format that that you can open in Microsoft Word. and can watch source file path and convert new uploading ms word doc, text, rtf or html documents to document files automatically. you can convert word doc to html, html to rtf, rtf to html, word doc to text, html to word doc, text to html and html to text etc, you can convert a lot of files once time, saving your time! A. batch convert word doc to html, html to rtf, rtf to html, word doc to text, html to word doc, text to html and html to text files quickly. B. watch source file path and convert new uploading ms word doc, text, rtf or html documents to document files automatically. While your user upload word documents to your website, then this folder watcher can automatically convert them into all kind of documents formats. F. fit to convert so much as over 1 million files in folder, you need not wait at all. What's New In CZ Document Converter? New! release CZ Document Converter V2.0 Build040310, add folder watcher that watch source file path and convert new uploading ms word doc, text, rtf or html documents to document files automatically. While your user upload word documents to your website, then this folder watcher can automatically convert them into all kind of documents formats. Release CZ Document Converter V1.5 Build020427 update the way of load files, you do not wait to convert so much as over 1 million files in folder. Release CZ Document Converter V1.0 Build020225 fix command line /h option, fix the problem pops up a screen while command line using /h param. Release CZ Document Converter V1.0. support convert between office document (word doc, rtf, html, text format and almost any other format that Microsoft word will support), beautiful GUI interface, support command line run, convert the files in subfolders. >8 other file format your office word can support, you can find it in CZ Document Converter's gui, please see following red frame. 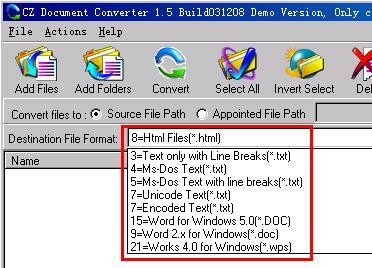 Yes, CZ Document Converter can convert between doc, html, rtf, text files very quickly. Yes, CZ Document Converter can support word xp. Yes. CZ Document Converter can support batch conversion between doc, html, rtf, text files, so much as over 1500 files. Yes. CZ Document Converter can convert very big document file, so much as over 5000 pages in a document file. Will this software convert MS Word documents to Coral WordPerfect documents?